Acne scar removal can make you feel like a whole new person. 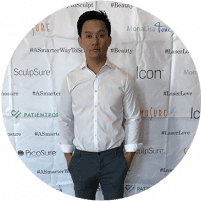 At Beau MedSpa in Glendale, California, Aaron Jeng, MD, uses specialized acne scar removal technologies like intense pulsed light therapy and the Cynosure ICON™ laser to smooth away the scarring for good. Book an appointment online now or call the Beau MedSpa office for an appointment with Dr. Jeng. Am I a candidate for acne scar removal? If your acne scars make you feel discouraged or even downright miserable, acne scar removal at Beau MedSpa may be a good choice for you. To be a good candidate for acne scar removal, it's important you commit to good skin care going forward. This reduces your chances of acne (and acne scars) in the future. Patients with nearly any skin tone can be good candidates for acne scar removal, but it's important to have treatment customized to your needs. Dr. Jeng does an evaluation to determine your candidacy and then discusses your treatment options with you. What are the treatments for acne scar removal? The acne scar removal technology Dr. Jeng uses depends on the type of acne scars you have. Post-inflammatory hyperpigmentation means you have red, brown, or otherwise discolored areas on your face due to acne. If you have only post-inflammatory hyperpigmentation, your skin is smooth, but discolored. For this type of scarring, Dr. Jeng may use intense pulsed light (IPL) treatments. IPL treatments can break apart the pigmentation, which is then gradually absorbed back into your blood for elimination. If you have skin depressions, either with or without post-inflammatory hyperpigmentation, Dr. Jeng can use the Cynosure ICON laser system. The ICON laser delivers short laser light pulses into the deeper layers of skin below the acne scars. This triggers your body to begin its natural healing process, which includes creating new collagen and elastin to fill in the acne scars and smooth your skin. Both post-inflammatory hyperpigmentation and skin depressions can be embarrassing and frustrating. But, no matter what kind of acne scarring you're dealing with, Dr. Jeng can help you choose a solution that really works. How long does acne scar removal take? Your appointments usually last about 30 minutes. The exact number of treatments you need depends on the intensity and depth of your acne scars, but most patients see optimal results with a series of treatments. For IPL treatments, most patients need around five sessions, and for ICON, most patients need 3-8 treatments, but Dr. Jeng will customize a treatment plan for you. Use the online appointment tool now or call the Beau MedSpa office to schedule an appointment today.